Southern New Hampshire University President Paul LeBlanc, right, speaks Tuesday, May 29, 2018, during a session with IDEA Public Schools students Wednesday in Weslaco. 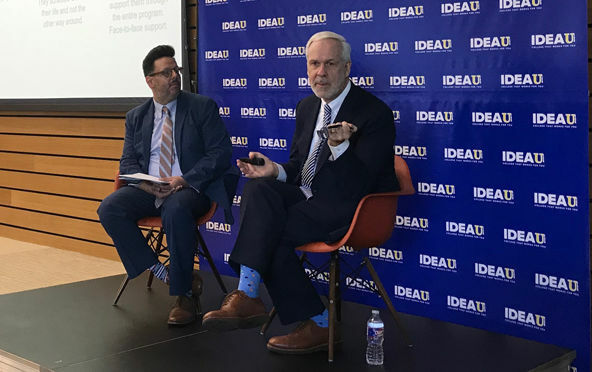 WESLACO — As IDEA Public Schools gets its footing in higher education, Southern New Hampshire University President Paul LeBlanc visited the campus to talk about the expansion of their recent partnership and a new initiative to provide 100 full scholarships to “DACAmented” students. It’s been nearly 10 months since IDEA opened its first higher education campus called IDEA-U in partnership with SNHU’s College for America and the first cohort of 109 students is well on its way to completing a degree. And as they prepare to enter into their second year and second cohort at their inaugural location in Weslaco, IDEA plans to open a second home base in Brownsville to accept 100 additional students, as well as awarding 100 full scholarships specifically for students under the Deferred Action for Childhood Arrival pro-gram, also known as DACA. SNHU received a $5 million donation to offer scholarships to 1,000 DACA recipients across the United States. Then, they contacted IDEA-U to make a portion of these funds available to 100 students from the Rio Grande Valley. A task that Phillip Garza, chief college and diversity officer at IDEA, is taking as an important challenge. Through College for America, IDEA began offering fully online degrees in August 2017. Students have two associate degrees to select from in the areas of healthcare management and general studies with a concentration in business. These are usually completed in eight to 14 months, but every program’s curriculum has a go-at-your-own-pace model aimed at allowing students from all backgrounds to complete a degree. There are also three bachelor degrees with several concentrations in each, including a bachelor of arts in management with concentrations in public administration, insurance services, logistics and operations; a bachelor of arts in communication with concentrations in business and health care management; and a bachelor of arts in health care management with concentrations in communication and global perspectives. The inaugural degrees were assessed based on the job market needs in the region, Garza said, but the cohort grows and the program expands through and outside the Valley there will be additional assessments to ensure the degrees are relevant. IDEA is working with local organizations and public school districts to make this information known to those who might benefit, he said. But the two-fold move however, means that the young program is growing from an inaugural cohort of roughly 100 students to 400 in a one-year span. This is considering the program plans to double the amount of students at Weslaco, add the Brownsville base and service the 100 DACA-mented students. And even as this particular scholarship is only available for those under the DACA program, he said undocumented students who are interested in the program should still reach out as there are other scholarship opportunities.